The natural urge to sing, dance, to make and listen to music wells up from the depths of each person, from birth to death. It can be stamped out at an early age or it can be fostered to enrich all of life. In this article you will find ways that music is important to us at every stage of life. What is music? What words can accurately describe it? We might as easily try to capture all the most poignant sights, sounds, and smells of childhood holiday celebrations into a single black and white collection of letters on a piece of paper! We may not know how to fully describe music but we do know that we don’t want our children to miss out on it. I have heard fascinating presentations by Adele Diamond, neuroscientist, both at the Annual General Meeting (AGM) in Amsterdam and at the AMI Educateurs sans Frontières (EsF) Assembly in Thailand in 2015. Dr. Diamond contributes a lot to the Montessori movement of nurturing children because she studies how executive functions—including the abilities to think outside the box, mentally relate ideas and facts, control impulses, focus and concentrate—are affected by biological and environmental factors. 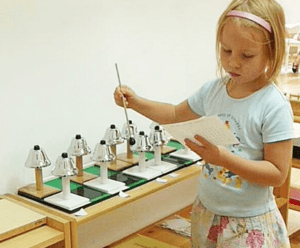 Recently she has turned her attention to the possible roles of music and dance in improving not only executive functions, but also academic outcomes, and mental health. In dozens of recent talks she points out that there is a reason dance, play, storytelling, art, and music have been part of human life for tens of thousands of years and are found ubiquitously in every culture; that perhaps we have discarded the wisdoms of past generations too readily.